After upgrade of CA11, when you save the Cognos Configuration you get a error message. This is in a multi server installation, and this can happen if the Cognos services are started in the wrong order. Reset the certificates on the server where you have the error. 1. 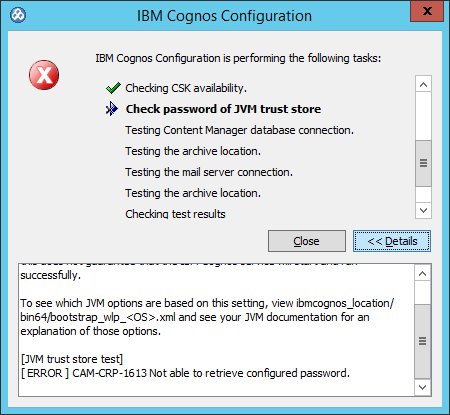 Stop the running of your cognos service in Cognos Configuration. 3. Choose ‘Yes’ at the prompt and save the file. For example, name it ‘backup.xml’ which will be stored in the c11\configuration folder. 6. In the c11\configuration folder, rename ‘backup.xml’ to ‘cogstartup.xml’. 7. Open Cognos Configuration, save the configuration and start the services. 8. Repeat steps 1-7 on all computers that have Cognos Analytics Server components installed. If needed – if it is only one CA11 that have issues, start with only change on that server. You can surf to http://ca11cm_servername:9300/p2pd/servlet to see if the CM is up.